It was opening night for Corella Ballet in Los Angeles at the Ahmanson Theatre last night. In addition to the distinction of being opening night, this is Corella Ballets first trip to the West Coast and only its second trip to perform in the U.S. The first trip was to City Center in New York in March of this year. Being the kind of Angel Corella fan that I am, we (that is, CarBoy & I) made the trip to NY to see him present his baby. It was really wonderful and I couldn’t wait to see them again, so when I heard that Angel and his company were coming to Los Angeles, I was overjoyed! I’m going to have to cover the evening in parts, there is just so very much to talk about! First up is actually the last piece of the evening, DGV. DGV: Danse a Grand Vitesse is choreographed by Christopher Wheeldon to music by Michael Nyman. It was premiered originally by the Royal Ballet. The costumes and sets were designed by Jean-Marc Puissant.The music was originally commissioned by the French railway to commemorate the opening of a high-speed train line between Lille and Paris. Leave it to the French to commission music for such an event! Los Angeles would… well, it doesn’t apply because we can’t even get a high-speed train built; we still have problems with bus lines!!! It was MGV: Musique a Grande Vitesse. Then Christopher Wheeldon adapted MGV to DGV for ballet. 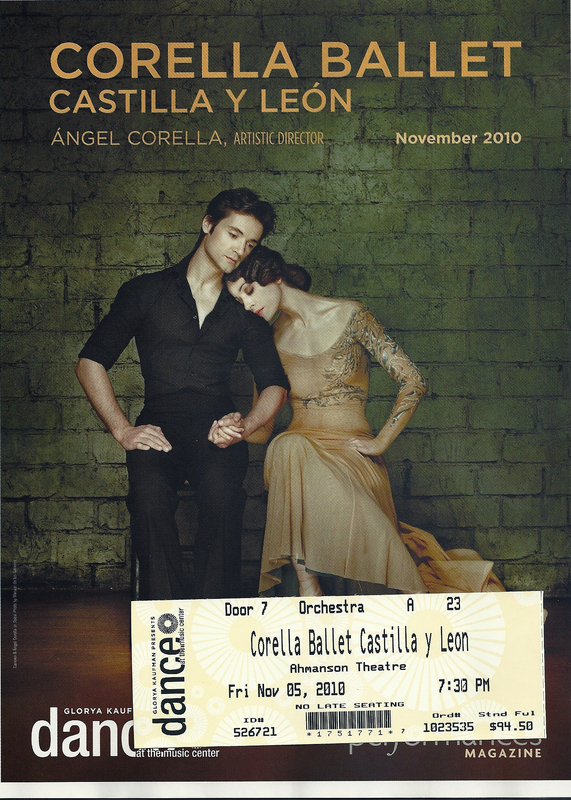 It was exclusively performed by the Royal Ballet of London until Angel Corella! The dance speaks to travel, thus the set is industrial, grays and metal, very urban yet not stark. The costumes involve gray tights and piped tops in softly muted marled colors of blue, green, and purple, with black piping. I was reminded of the 1927 silent film Metropolis or the Disney classic Tron. The sets and costumes worked well to fit the mood and the dance. It’s not that poor sets and bad costuming takes away from great dance but it can detract from a great performance. In this case, the sets, the costumes, the lighting, the scrim at the opening were fantastic, everything working to strengthen everything else. DGV features four couples and the corp. The first couple was Carmen and Dayron Vera. Carmen worked hard tonight dancing three of the four offerings! I love Carmen and never understood why she was so underused at ABT. She’s got beautiful long lines and a gorgeous face, she and Angel share that amazing smile. Dayron Vera is Cuban, looks young, and is new to the troupe. He dances better solo. He had a little trouble partnering Carmen but she took it in stride and helped him out. It was really cute that he looked shocked to receive big time applause. He’s tall and he has these great long, slender limbs that go on forever. Plus he has a great head of curly hair, sorry but I’m a sucker for great hair. The second couple was Kazuko Omori and Kirill Radev. I remember Kazuko from NY because she did some awesome things, but it was not her night. She wasn’t awful but she wasn’t memorable. She has the ability, I saw it in NY, maybe she just had a bad flight or something. She kept a smile on her pretty face and kept going for it though! Kirill was fantastic in NY & LA, he’s cute and blonde and can carry a girl around above his head forever and look completely at ease. He has a nice jump and a lovely gracefulness. The third couple was Natalia Tapia and Aaron Robison. Natalia is kick a$$. She could stand to eat a few more cookies but she wowed the audience with every step. She has limbs that go on forever and insane flexibility, she does a extention that is crazy! Paired with Aaron, you can’t go wrong. Aaron moves cleanly and quickly. He bloodied a knee is an earlier piece, which just goes to show you, he definitely goes all out in a performance. Their pdd included a trust move where Aaron extends Natalia out by holding onto her ankle, which sort of leaves a lot of room for the girl to hit the ground face first if done poorly or looks fantastic and edgy when done well. It was fantastic and edgy. Angel danced this part in NY. There is a segment performed in silence danced in a sort of slo mo – it’s beautiful, perfect art. The fourth couple were Cristina Casa and Fernando Bufala. I’m going to tell you that I am a Cristina and Fernando fan! Throughout Cristina just looked like she was having a ball! She is a spitfire! Cristina definitely has a Kitri inside her. She is tiny, fast as lightening, and fun to watch. Fernando is a young Angel, from the smile to the rapid fire turns. They had a great time dancing and we had a great time watching – that is really the essence of a great performance, don’t you think! The corp was fantastic, DGV is an impressive piece, very, very full. It’s a piece that is contemporary without being aloof, new without needing to shock, infuses difficult dancing without having to resort to tricks, and shows off corp, pdd, and individual skills. Thumbs up all around.